Asian equities reached a four-month high overnight, supported by optimism that the world’s two largest economies would be capable of reaching a deal to resolve their nearly year-long trade dispute. President Trump indicated that he is open to moving the March 1 deadline to hike tariffs on Chinese products if the two sides are near an agreement. Also aiding investor risk is the announcement of a tentative U.S congressional spending deal to avert another partial government shutdown. In Europe, aside from trade talks, the fact that earnings growth forecasts were no longer falling in Q4, after a steep downward revision, is giving the greenlight to own some stocks. Elsewhere, oil is extending its rebound from a two-week low after the Saudi’s pledged to deepen output cuts. On the central bank front, the Reserve Bank of New Zealand (RBNZ) was ‘less dovish’ than anticipated and this provided the Kiwi dollar a massive boost outright against market expectations, while Sweden’s Riksbank bank left their repo rate unchanged and maintained their rate path outlook. And in Spain, the minority Socialist government said it plans to hold an early general election after its expected defeat in a budget vote today. On tap: Chinese VP Liu He is to join U.S Trade Representative Lighthizer and Treasury Secretary Mnuchin in high-level trade talks Feb 14-15 and U.S data out this morning (08:30 am EDT) is expected to show U.S consumer prices rose +0.1% in January. In Japan, the rallied to trade atop of its two-month high overnight on optimism that Sino-U.S trade talks may be nearing a deal to end their trade dispute. The index surged +1.3%, the highest closing level since Dec. 17. The broader gained +1.1%. Down-under, shares fell overnight, dragged lower by drug maker CSL after posting a disappointing H1 profit rise. The fell -0.3% at the close of trade. The benchmark had rallied +0.3% yesterday. In S. Korea, stocks moved to session highs amid broader strength in Asian equities as the Kospi moved back towards its 2019 high. The benchmark rose +0.5% as memory-chip makers Samsung Electronics (KS:) climbed more than +2%, which helped to offset the -1%-plus declines in construction stocks and investment banks. In China and Hong Kong, stocks rally after President Trump hinted at a Sino-U.S trade truce extension. The index closed +1.8% higher, a level not seen since October, while the blue-chip CSI300 index rose +2% to its highest point since late September. In Hong Kong, stocks hit their highest close in six-months. The ended +1.2% firmer, while the Hang Seng China Enterprises index closed +1.4% higher. In Europe, regional indices trade slightly higher across the board following on from a strong close stateside yesterday. Crude oil prices have rallied overnight, after Saudi Arabia said it would cut crude exports and deliver an even deeper cut to its production, while U.S futures gained on a decline in domestic oil inventories. futures have rallied +88c to +$63.30 a barrel, while U.S futures gained +66c to trade at +$53.76 a barrel. Both Sino-U.S trade tensions and geopolitical uncertainty has dented the crude “bull’s” faith in owning the stock. However, a helping hand has come from OPEC+, who said yesterday that it had cut its output by almost -800K bpd in January to +30.81M bpd. Note: Most of that reduction has come from the Saudi’s – Energy minister Khalid al-Falih indicated that production would fall below +10M bpd in March, more than half a million bpd below the target it agreed to as part of a global deal to limit supply. Also, U.S restrictions on Venezuela’s energy sector have crippled their exports and threaten to remove some -330K bpd in supply from the market in 2019. 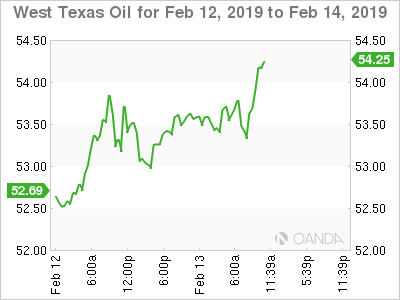 Note: Year-to-date, oil prices have risen by +20% in 2019, yet most of that increase occurred in early January, before U.S sanctions on Venezuela. Ahead of the U.S open, gold prices have inched a tad higher, supported by a weaker buck on hopes of a deal between the U.S and China, but improved investor risk appetite is capping investors gains. 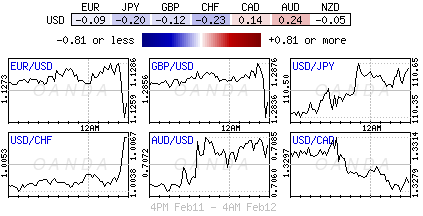 is up +0.1% to +$1,312.36 per ounce, while U.S have gained +0.1% to +$1,315.3 an ounce. 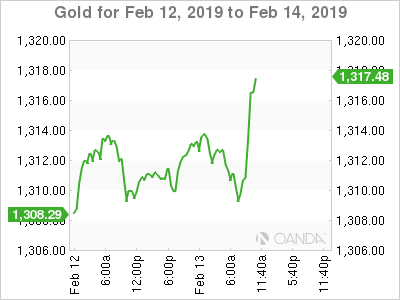 Gold for Feb. 12-14, 2019. Earlier this morning in Sweden, the Riksbank left the repo rate unchanged at -0.25%, as expected. Swedish policy makers indicated that growth is more “subdued,” and that economic activity remains strong and that conditions for inflation have not changed to a significant extent. Against that, the Riksbank indicated that the next increase would be during H2 2019, which was also left unchanged. Overnight, the Reserve Bank of New Zealand (RBNZ) held the official cash rate at +1.75%, in line with widespread expectations. The RBNZ reiterated the pledge to keep the rate at the current level through 2019 and 2020. Governor Orr repeated that the next move could be up or down. The announcement was “less dovish” than expected as the RBNZ expect low rates to maintain growth along with positive fiscal policy. In Spain, bond yields are trading at their lowest in a year at around +1.24%, despite the elevated uncertainty around the upcoming budget vote and the possibility of snap elections. Elsewhere, the yield on 10-year Treasuries fell less than -1 bps to +2.69%. In Germany, the 10-year Bund yield has decreased -1 bps to +0.13%, while in the U.K the 10-year Gilt yield has declined less than -1 bps to +1.184%. 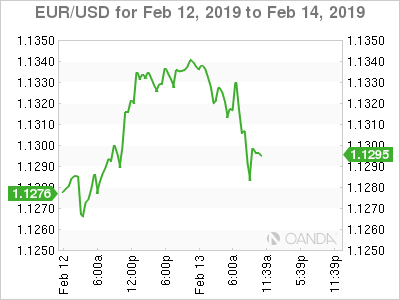 EUR/USD for Feb. 12-14, 2019. Ahead of the U.S open, the USD is a tad softer and taking a reprieve from its recent “bull” run. (€1.1318) is little changed but holding above the psychological €1.13 level for now. Investor focus is now turning to Germany’s GDP data due out on tomorrow. How bad are things in Europe’s largest economy? (£1.2881) is a tad lower after U.K Jan CPI slowed more than expected, but moved back below BoE’s inflation target for the first time in 24-months (see below). (€10.4203 -0.53%) cross has moved lower after the Sweden’s Riksbank kept its policy steady and maintained its forward guidance for the next potential rate hike in the H2 part of 2019. Note: SEK strength is being attributed to the Riksbank Board not renewing its mandate on FX intervention. is firmer by +1.25% at NZ$0.6820 as the central bank pushed out its forecast for an interest-rate increase to early 2021, thereby paring investors’ dovish’ positions, who were looking for signs of a policy easing later this year. 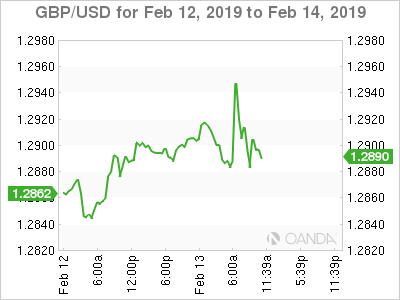 GBP/USD for Feb. 12-14, 2019. Data out of the U.K this morning showed that January’s year-on-year CPI fell below the Bank of England’s (BoE) +2.0% target for the first time in two years to +1.8% from +2.1% in December. Market expectations were looking for a smaller fall to +1.9%. Digging deeper, core-CPI remained steady and as expected at +1.9%. This morning’s lower-than-expected inflation data is not enough to push the pound lower as the market remains focused on uncertainty surrounding Brexit. U.S. Dollar Index Feb. 11-12, 2019.